Experimental Drug Reverses Effects Of Toxic Wild Mushrooms : Shots - Health News Four wild mushroom foragers who mistakenly ate toxic fungi they found near Washington, D.C., were treated with an experimental medicine that's been used in Europe for years. Poisonous mushrooms, such as the Amanita phalloides, have been sprouting up all over the East Coast thanks to the recent wet weather. Maybe it's something about this funky, rainy weather that has people chowing down on strange mushrooms. Regardless, for unlucky foragers who have consumed a poisonous mushroom, a drug still in clinical trials may avert potentially deadly consequences. Doctors at Georgetown University Hospital have treated four people in the last month with the experimental drug silibinin after they ate toxic mushrooms picked in Virginia and Maryland. The first two men to check in for poisoning have recovered. The other two women are in fair condition, Dr. Jacqueline Laurin, a liver specialist, tells Shots. The wet weather that has doused the mid-Atlantic recently has created a nursery-like environment for the Amanita mushroom family — the genus responsible for most mushroom-related illnesses fatalities. 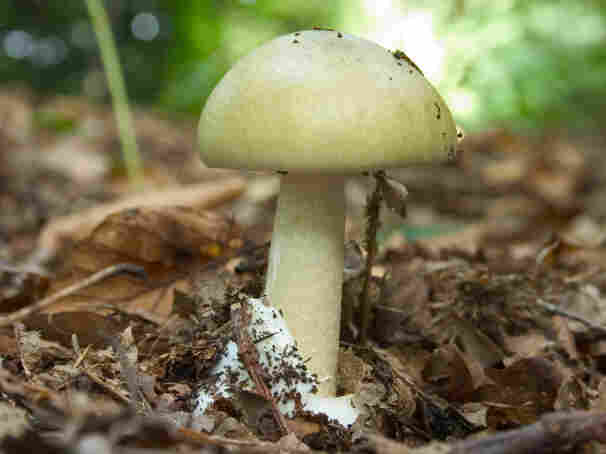 Some of the toxic species sprouting in backyards and fields are dubbed with names seemingly inspired by metal bands, such as "Death Cap" and "Destroying Angel." About two weeks ago, a man in Maryland and another one in Virginia mistook the toxic fungi for harmless varieties and scarfed them down. A few hours later, the men were suffering from severe nausea, vomiting and diarrhea. When ingested, poisonous Amanita mushrooms release toxins that damage liver cells, or hepatocytes, and can cause complete liver failure. Laurin treated all four patients with the drug after reading a research paper detailing its effectiveness. Silibinin, sold as Legalon in Europe, was approved for the treatment of mushroom poisoning there. The drug comes from the milk thistle plant and works by stopping amatoxins from reaching the liver. Laurin initially got approval from the hospital's Institutional Review Board for a one-time emergency use of the drug, which is in its final stages of testing for U.S. approval. With help from the local Poison Control Center, she contacted the lead researcher of the clinical study in Santa Cruz, Calif. The drug was expedited to her and she eventually got approval to use it for a month. Before silibinin, doctors used penicillin to treat mushroom poisoning. It doesn't pack the same punch, though, as the promising trial drug, according to Laurin. She says she hopes the FDA will approve silbinin soon. In any event, she recommends people don't eat mushrooms unless they're 100 percent sure they're safe.